Alessi Fruit Basket by Pierre Charpin 8 inch dia PCH02/20. Polished stainless steel fruit basket provides a sturdy and durable decorative bowl to store and thoroughly ripen fruit and food goods in a fashionable manner. A classic Alessi design created by French designer Pierre Charpin. An essential piece of the Alessi collection. 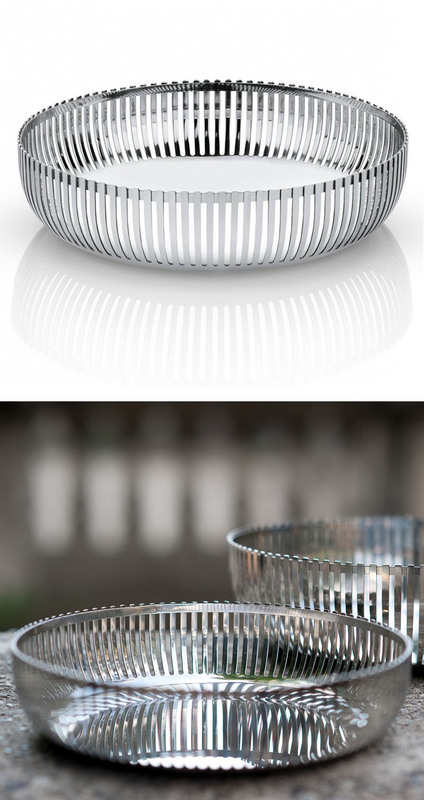 The Alessi Pierre Charpin Basket is the French designer's take on Alessi's long-existing collection of stainless steel baskets. The clean, curving lines of the open lattice structure gleam in a Mirror Polished finish. Alessi creates stunning products that celebrate Italian industrial culture. With impeccable designs, vibrant colors and unique shapes, Alessi brings a modern touch to any home. Ranging from cutting edge creations to groundbreaking vintage pieces from their archives, Alessi continues to push Italian design in exciting new directions. French designer Pierre Charpin was born in 1962 in Saint-Mand鬠Paris. He studied art at the National School of Fine Arts in Bourges, graduating in 1984. This fruit bowl/basket measures 8 inches in diameter and 2 inches in height. PCH02/20, fruit holder - Alessi fruit holder. Alessi Pierre Charpin Fruit Basket by Alessi - Mirror Polished. Wipe with a soft non-abrasive cloth to retain quality. Great wedding gift idea, housewarming gift. Made by Alessi in Italy.